Parking lot permits are available to seniors and juniors at Roosevelt throughout the year and permit forms are available in the VP office. Students complete the form, including make, model, year, color, license plate number, and return with $20. Students must provide a current valid driver license and insurance card for the vehicle to complete the process. First come, first serve parking in the student lots. A PARKING PERMIT DOES NOT GUARANTEE A PARKING SPOT! Students may not park in the staff parking lots, illegal areas as marked, and will receive parking citations when illegally parked. Parking Permits are non-refundable, good for school year of issue only, must be clearly visible in the driver-side rear window corner, and are non-transferable. No replacement parking permits will be issued. Clean the surface before you apply your label. Dry the surface completely. Labels stick best to smooth surfaces, such as glass, metal, plastic or paint. Avoid sticking labels on textured, dirty or wet surfaces. Bend back the label to expose the tab around the label. There is a ring around the label that makes it easy to lift off the label. 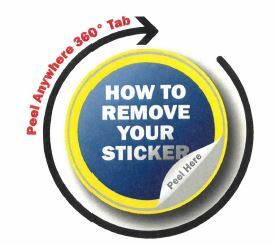 Avoid picking, rubbing or scraping label. Peel the label off the liner. Be careful not to touch the adhesive. Apply even pressure across the entire label to ensure full bonding. Adhesive labels need 24 hours to fully bond to any surface. Do not re-stack stickers face-to-face.